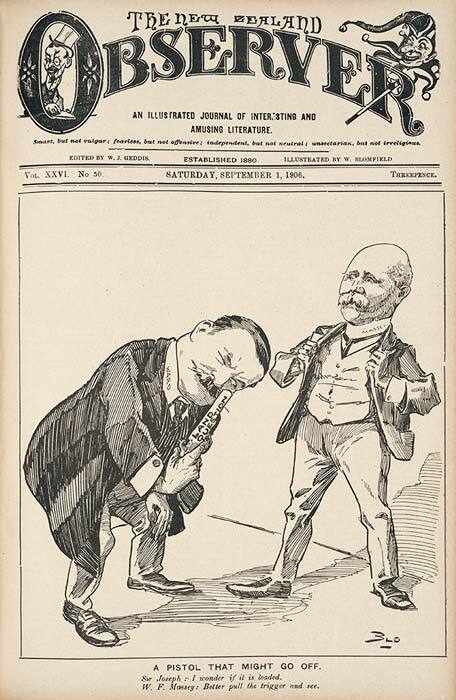 The front page of the Observer of 1 September 1906 features a William Blomfield cartoon showing Prime Minister Joseph Ward and opposition leader William Massey contemplating the issue of land ownership. 'Blo' was one of New Zealand's pre-eminent cartoonists from the late 1880s through to his death in 1938. He was particularly well known for his caricatures of politicians, including Premier Richard Seddon and Seddon's successors Joseph Ward and William Massey.